Remember when I said in this post that waiting for butterflies in your stomach is not the way to know if you have found love? Love may be butterflies in the stomach after all. Partially. At least according to this research on how our body experiences emotion. In this study, a team provoked emotions from surprise to depression among 700 people. This enabled them to observe how we, humans, experiences emotion. For exampe, anger manifested itself in the chest, head, and fists. Which makes sense, right? When we are angry, we feel it in our chest. Then our head comes in with saddistic thoughts. Then we start flexing our fists, waiting for that emotion to come out. If we feel sad, we feel cold. Lonely. We lose appetite too. 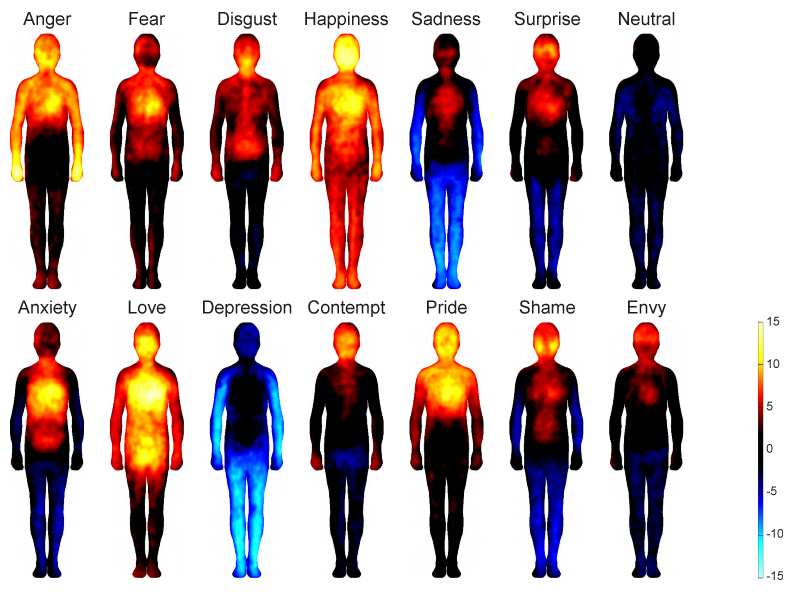 And through this research they discovered it is exactly how our body reacts to an emotion. Sadness in this case produces coldness in our arms and legs. Our stomach was void of anything. Our chest and head a faint reaction, no doubt because we are feeling pain or entertaining thoughts, the what-ifs. Look at depression! Our whole body turns cold, and our stomach and chest void of anything. Which, partly explains why depression can lead to suicide. But look at love! Most of our body, especially our chest, face, and that part below, are all fired up when we are in-loved. Definitely some butterflies there. The emotions you feel--for example, fear--help prepare your body to avoid threatening people or situations, explains study coauthor Lauri Nummenmaa, PhD, of Finland's Aalto University. Your emotions also help you feel at ease in socially rewarding settings. And just as your emotions help prepare your body for different scenarios, the way you feel physically can reinforce your emotional state, Nummenmaa says. "We think that these maps are important because they further underline the strong link between mind and body," Nummenmaa says. "Emotions are experienced as mental, but also as bodily states." Now that we know that, we should be able to control ourselves better. If you are sad and you do not have an appetite, fight it. It is all because of your current emotional state. As we often hear, it's all in your mind . Photo source: What Sadness Really Feels Like, used under Fair Use.